One of the features which the Volkswagen Beetle has retained since 1962 is the windshield washer system. Though it has varied in some details, it has remained a pressure operated system. The fluid bottle was to be filled with clear water or a windshield washing fluid which could consist of an anti-freezing-cleaning solution for winter months or for colder climate zones. This bottle was also marked with either a yellow or red decal. Both are correct. It just depended on what the factory had on hand. Pressure in 1961 was generated by a diaphragm—the switch was pulled to activate a diaphragm which pulled water from the unpressurized fluid bottle and pushed it through the washer nozzles onto the windshield. For 1962, the bottle was changed so that it could be filled with liquid, the cap screwed shut and the bottle pressurized by use of a tire pump or some other source of compressed air. The washer hose, of course, changed to accept this pressure. The hose was routed around the gas tank to the passenger’s side and then to the washer switch. The bottle cap (in the Owner’s Manual illustration) was white and knurled. 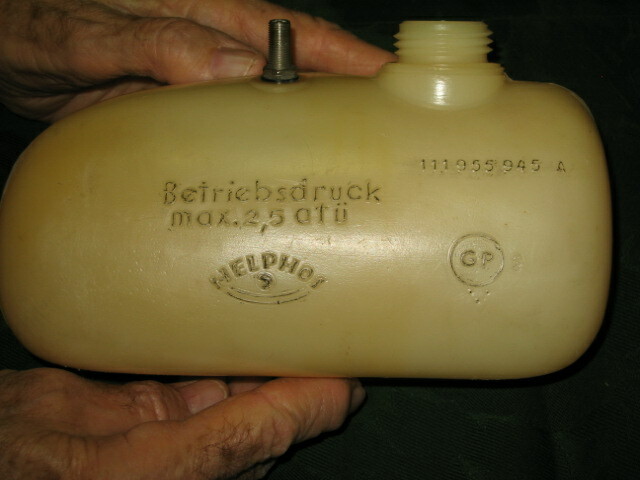 Helphos was a major manufacturer of the washer bottle (perhaps the sole manufacturer). In the photo below, Logo and other identifying information has been highlighted in black for illustrative purposes only. The Part Number is 111-955-945A. The same washer bottle was used from 1962 through 1967. The components of the washer bottle are the inlet air valve and the bottle top and siphon tube. 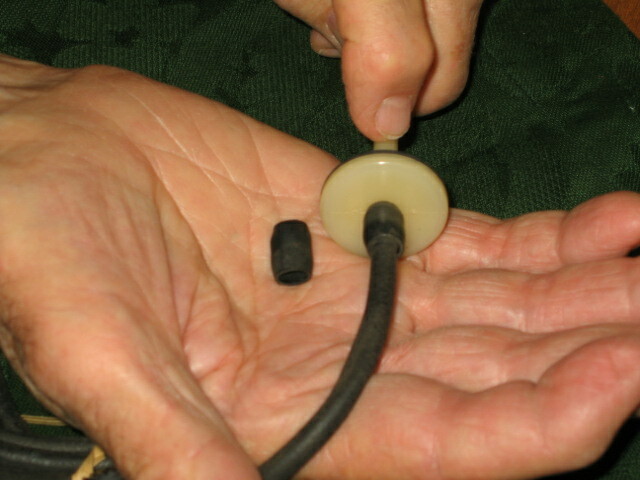 A tiny plastic strainer is pressed into the flared end of the siphon tube. Twin nubs on the bottom of the bottle fit two holes of equal dimension in the cavity behind the spare tire. With the bottle slightly tilted towards the installer, it is pushed into the cavity and the nubs aligned to these holes. Grasping the bottle firmly and pushing, rotating forward into the cavity, the bottle can be forced into place where the nub on the backside of the bottle causes a friction fit. 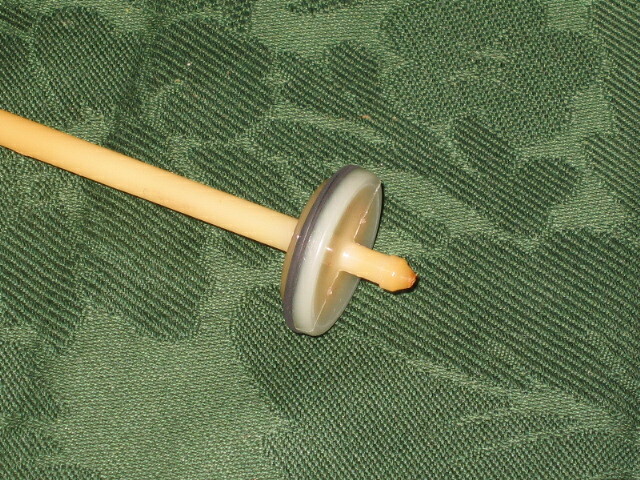 A short rubber sleeve is placed around the tube where it connects to the siphon tube top. 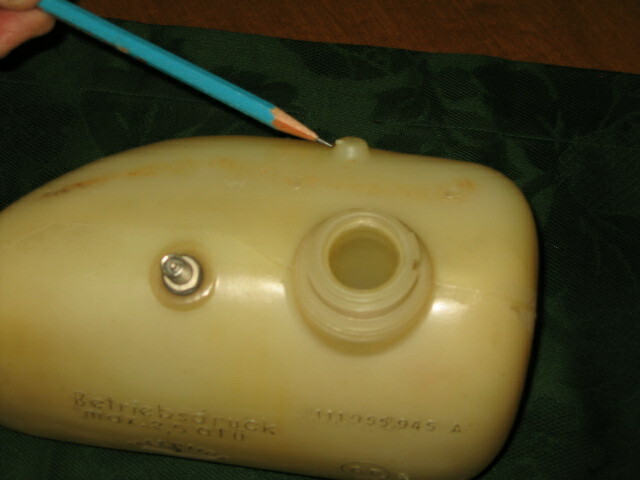 An identical sleeve is used where the rubber fluid tube connects to the wiper switch inlet tube. These reinforcing sleeves keep the fluid tube from splitting where it is stretched. This pattern of installation and operation continued through 1966. In 1966, according to the Owner’s Manual which I viewed, the cap was black with a fine-ridged edge for grasping. For 1967, the same bottle was used with the same black lid. 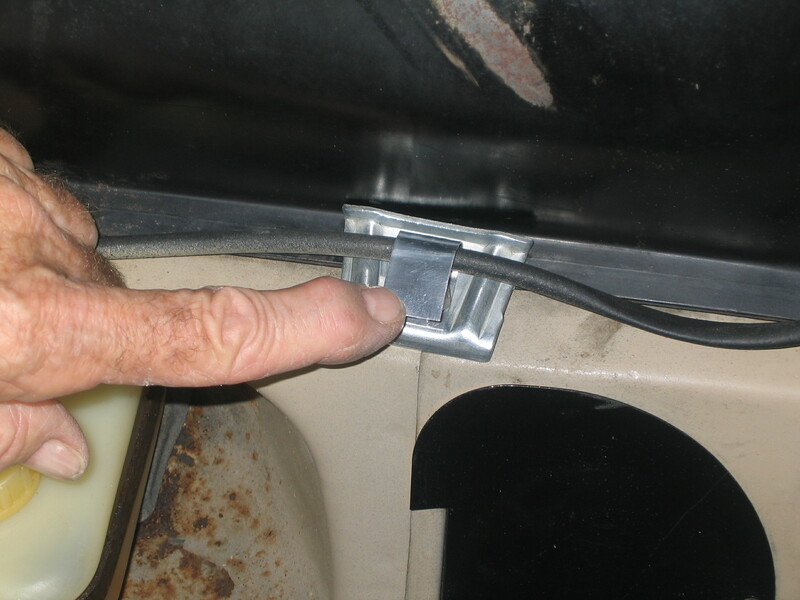 One thing changed—the hose was routed, now, around the gas tank to the driver’s side and thence to the wiper switch. 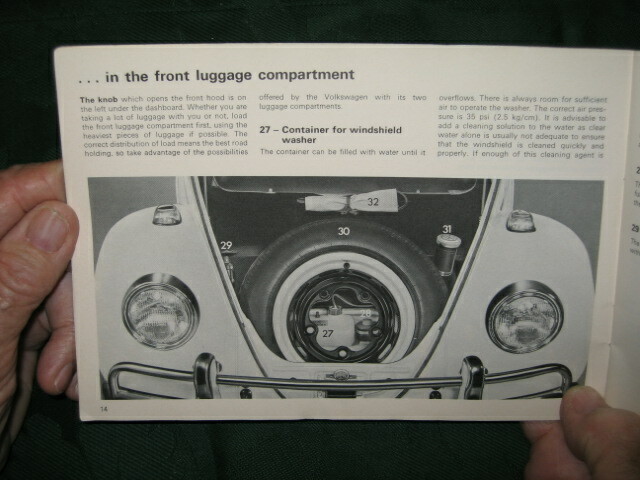 Page 23 of the USA 1967 Beetle Owner’s Manual shows this feature. 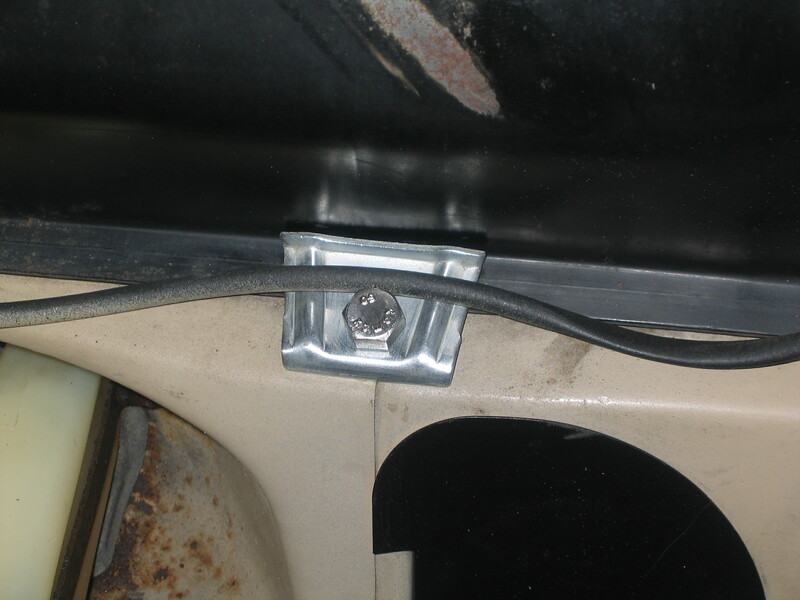 In order to keep the hose from dangling as it passed around the gas tank, an aluminum tab was employed. (a mechanic from the ‘60s reports having seen these also in steel). Made of thin sheet aluminum, the tab was easily bent to fold over the passing hose to hold it into place. 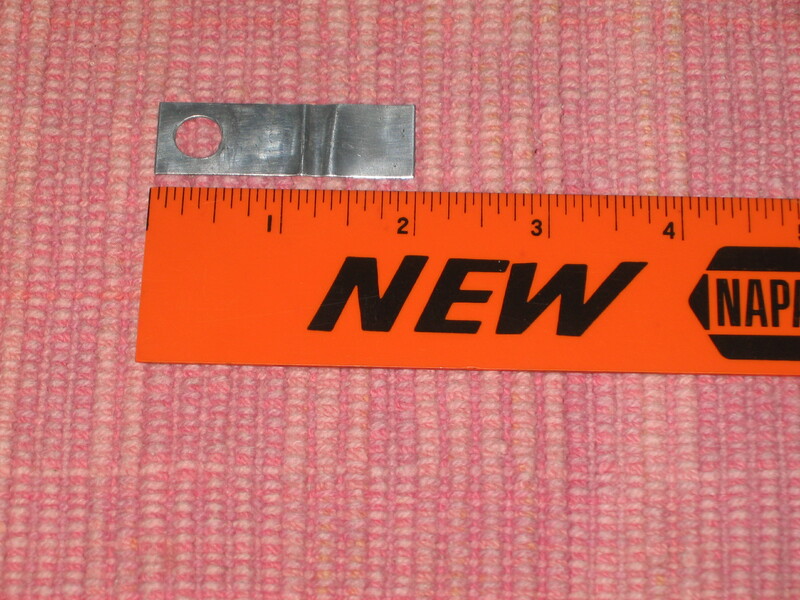 The tab had a hole at one end to accommodate an 8mm bolt (13mm head). 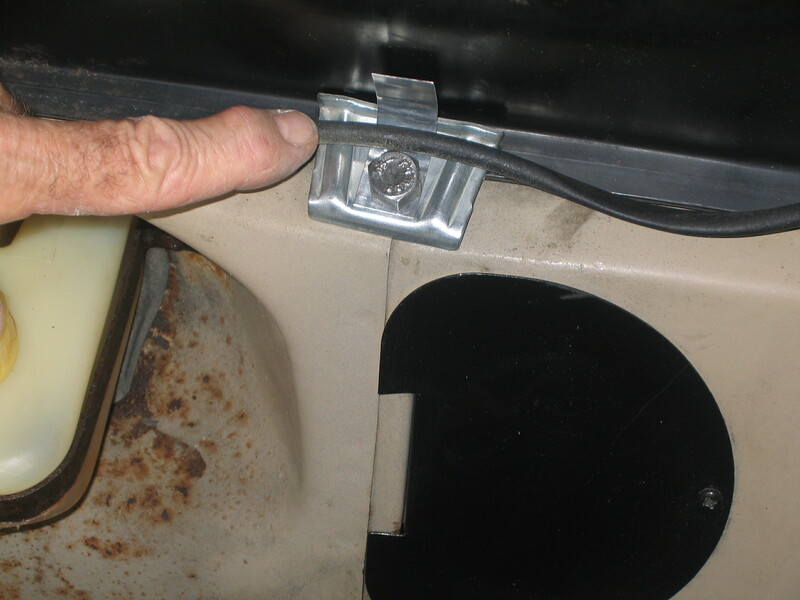 Utilizing the gas tank securing bolt, the tab was placed atop the driver’s side front gas tank mounting cleat and the securing bolt installed. The hose was placed atop the tab and the tab bent lightly over the hose away from the tank. 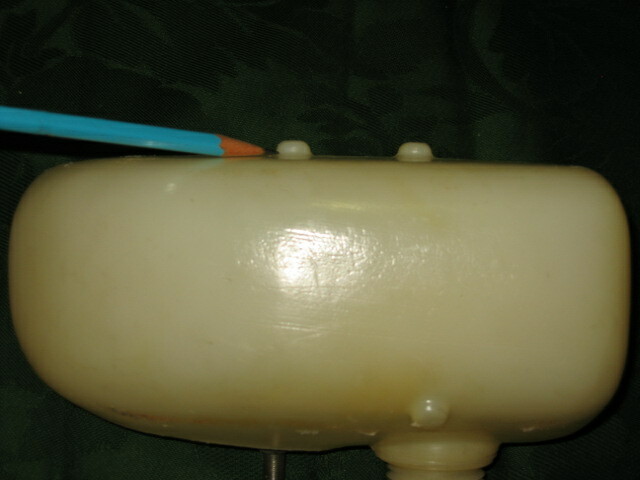 The hose was then captive between the tank and bolt head. Although the bottle still was pressurized using a pump or air tank (typically they were pressurized at the filling stations), an accessory became available which would link the spare tire to the bottle. One end was screwed to the valve of the bottle and the other, to the spare tire valve. In this manner, the bottle’s pressure could be maintained for a longer period of time. Some have laughingly called this accessory “the spare tire deflater”. Note: In 1968, the washer bottle was enlarged and relocated to inside the back of the spare tire and was fitted with a factory tube from the tire valve to the bottle valve. Jay does it again with another great contribution to the ’67 Beetle community. What would we do without this guy?! I think about 10PSI, max. Sadly, my Father blew my air tank back around 1972. It’s not functioned since….. It’s a wonder I sleep at night. 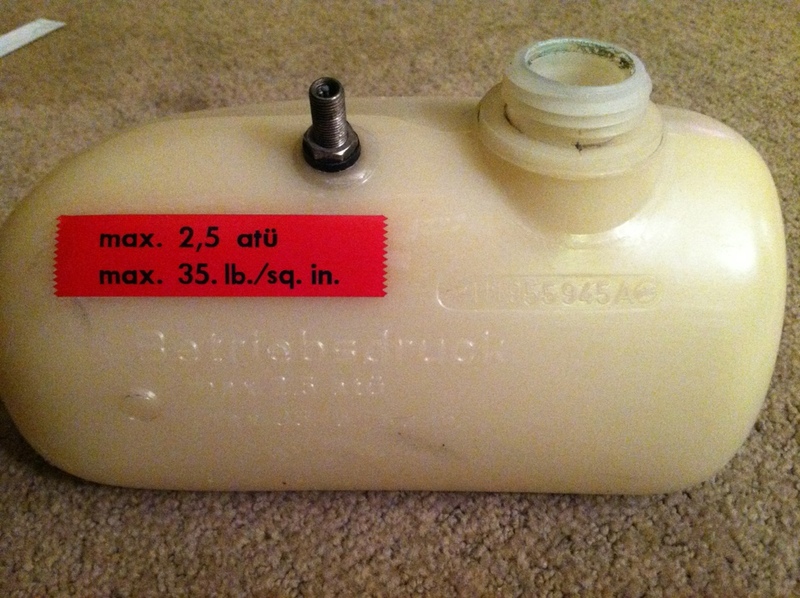 Jay: In later VW years, the owners manual states that a pressure of 42 lbs should be maintained in the washer bottle. In order to prevent the spare tire from being totally deflated, the hose from the spare tire valve to the washer bottle incorporated a cap that would limit the working pressure to 26 lbs minimum so that the spare tire would always maintain a drivable pressure. I don’t know if the accessary included this feature in 1967, but I’m pretty sure that it did. My washer tank won’t pressurize. Taking out the valve stem, there is something closing off the bottom which, I’m guessing, is stuck or not working properly. Any suggestions to get this working again?